Manufacturer : Arcooda Manufacturing Ltd. 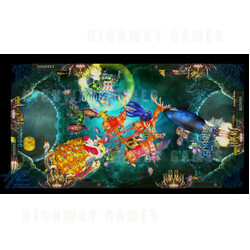 The Santa Treasure Arcade Game is an ocean themed, video redemption fish hunting game which features the famous Santa Claus and his reindeer as a character in the game! The game is quite simple and straight forward, and easily recognisable for players familiar with other fish hunting games. Players face off in head-to-head competition to catch as many fish as possible! Apart from Jolly Old Nick, the other fun fishy characters that can be found in the game include Spearfish, Lantern Fish, Lionfish, Turtles, Fugu, Butterfly Fish, Devilfish, Crabs, Lobsters, Octopus, Sharks, Golden Sharks, Whales, Killer Whales, and more! There are over 20 fish characters in this game to try and catch. The characters have also undergone a drastic transformation, with many of the medium and larger fish covered in armour and looking electrified with fluro greens, pinks, and blues, etc. This gives a whole new look and feel to the game that will have players intrigued! With so many cabinet options, this game is suitable for a wide variety of locations, while it's numerous configuration options allow operators to completely customise the game for their location and cater to their players' needs! Lucky Dice - a feature that affects certain fish. When players catch fish with this effect it will grab all the other fish of the same kind on the playfield at the time and catch them all for the player! Golden Time - a weapon upgrade feature players can get by catching 5 Golden Sharks during the game! When 5 Golden Sharks have been caught, players will receive a largr Golden weapon that is super powerful for a limited time. Treasure Genie - there are genie trapped in random Winnings treasure chest, catch the floating treasure chest and release them to win big! Free Bullet Treasure Chest - a floating treasure chest that grants players free bullets when caught.